Inserts : why reline ? The need for chimney insulation is a relatively new concept. Efforts to increase energy efficiency in all fuel-burning appliances has led to lower flue gas temperatures. These lower temperatures in flues can cause problems in chimneys that do not insulate the gases from outside cold. Insulation between the shell and the liner of an outside chimney prevents rapid heat loss from the flue gas. Insulation is less important in those portions of chimneys located inside buildings, although insulation almost always improves chimney performance. greater likelihood for flow reversal or "back drafting". The warm air in a house tends to rise because it is less dense than the colder air outside the house. This tendency to rise produces slightly higher than neutral pressure in the upper levels of the house and slightly lower than neutral pressure in the basement of the house. Basement installations may be susceptible to venting failure, particularly when connected to uninsulated outside chimneys that may not produce strong draft. In winter, your house is also an enclosed column of warm, buoyant air creating a form of "draft". In effect, the warm air pushes up towards the top of the house, creating higher air pressure. At he same time, the pressure in the basement is lower than the pressure outside. That is why the basement of a leaky house feels "drafty" as the cold outside air is drawn into the area of low at pressure, while rooms on the second floor are more comfortable. The difference in pressure at various levels of the house is referred to as a stack effect. This stack effect competes with a chimney that serves an appliance in the basement of the house. Some houses make better chimneys than others. Two-or three-storey houses produce more stack effect than bungalows because their column of warm air is taller. A house with most of it leaks at the upper levels tends to produce more stack effect because the leaks offer a ready path for warm air to escape-like the open top of a chimney. Good chimneys-ones that are insulated and run up through the house - are usually able to overcome the influence of stack effect. Un-insulated, outside chimneys can reverse if the stack effect is strong enough, allowing smoke or cold outside air to spill into the house through the appliance. Choosing a main floor appliance location. 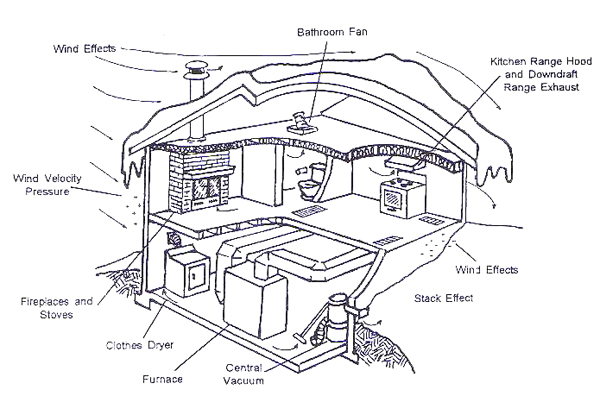 One situation in witch the influence of the stack effect is most troublesome is where an appliance served by an outside chimney is installed in the basement of a single-storey addition to a two-storey house, as shown in the illustration. If most of the leaks in a house are on the downwind side, wind can cause the whole house to be depressurized. In the case illustrated above, the house is built into the side of a hill, so most of its doors and windows, are therefore leaks, are on the downhill side. To open a windows on the windyard side can help pressurize the house. To open a windows on the downside will lower the pressure in the house. Most houses coutain one or more devices that exhaust air to outdoors. Examples of exhaust devices are kitchen and bathroom fans, clothes dryers, central vacuum cleaners, end vented combustion equipement. When a large exhaust removes a lot of air from a house, the leakage trough gaps in the vapour barrier and around doors and windows may not be enough to keep the house from being seriously depressurized. If a back draft situation exists, the use of these devices should be reduced or eliminated when the woodstove or fireplace is in use. All of the house features and weather-related influences shown below can affect the way a wood burning system operates. The challenge is to recognize all the influences and minimize their possibly negative effects on the wood burning system. The house as a system" concept is a way of viewing a house as a whole system rather than a number of unrelated parts. It is the understanding that chimney venting is influenced by several factors and is dynamic rather than static in nature. The spillage of combustion gases into the house produces unhealthy indoor air pollution. Spillage and backdrafting should always be viewed as venting system failure. Combustion spillage is most often caused by adverse pressure that opposes the draft produced by the chimney. There are three main sources of adverse pressure. The wood stove itself is not one of them. 1/ Always check chimney for obstacles (bird nests, branches, leaves). 2/ Always use seasoned wood or split green wood finer and mix it with dry wood. 4/ Installing a regular chimney cap can often solve downdrafts caused by winds. 5/The lack of air in the living space, can be solved by opening a window on the side of the house the wind is blowing against. 6/Make sure all fans (heating, ceiling...) are shut off when operating the fireplace. 1/The flue is either too small or too large for the appliance. 2/Too much creosote (soot) buildup in the flue. 3/The house is so airtight that not enough make-up air can flow in to feed the fire. 4/Other vents in the house allow excessive amount of air to escape creating a low air pressure in the house. 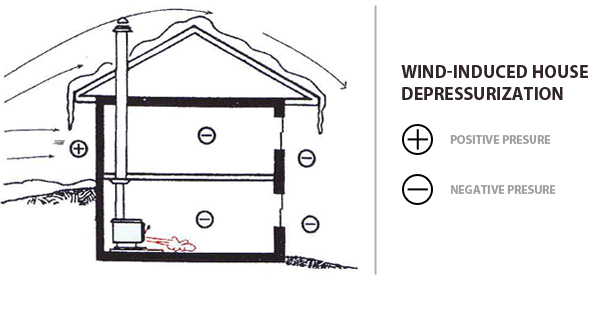 5/Action of the wind creates negative pressure thus creating poor chimney performance. The main problem with most fireplace inserts is that homeowners or handymen install them instead of « qualified » technicians. When homeowners perform their own installations, they often take the word “insert” too literally and merely inject the fixture into the firebox, like it was a cassette, not realizing that the lack of a chimney liner can cause a major fire hazard. Without a liner, functional problems are rarely apparent, giving the false impression that all is well but with each repeated use, dangerous conditions are gradually taking place. When no liner is installed, smoke fills the space between the insert and the firebrick lining, rather than going directly up the chimney. This can cause an important amount of creosote formation right behind the insert. Creosote being highly flammable, imagine what can happen ! The best way to prevent this or any other type of accident, is to install an approved metal liner to channel the smoke directly to the top of the chimney. Although the cost of installation may seem high, the expense is more than justified, given the potential consequences of an improperly installed insert. To avoid all types of hazards with fireplaces, wood stoves, inserts or wood burning fixtures of any kinds, the very best advice is to let a professional do the installation and any necessary repairs. The do-it-yourself approach can be a good way to get burned. It is the law. The National Fire Protection Agency (NFPA 211) requires all masonry chimneys to have a liner. Use of a liner within the chimney helps contain excessive smoke or fire within the chimney. By containing the high fire temperatures, less heat is radiated directly through the chimney itself. Less damage is likely to occur to wood joists and other combustibles located near the chimney. If a breach (crack or hole) develop in the chimney, the liner would still act to contain flue gases. Building codes require that the top of the chimney extend not less than 3 ft. Above the point it exists the roof, and 2ft. Higher than any roof, building or other obstacle within a horizontal distance of 10 ft. These rules are intended to place the top of the chimney higher than any areas of air turbulence caused by wind. In practice, chimneys must sometimes be raised higher than this clean air turbulence caused by nearby obstacles. The chimney should be installed within the house rather than up an outside wall. When chimney run up outside walls, they are exposed to the outside cold and this chilling effect can reduce the available draft at the appliance. Chimneys that run up through the house benefit from being enclosed within the warm house environment, produce stronger draft and accumulate fewer creosote deposits. Taller chimneys usually produce stronger draft. A rule of thumb for minimum height states that the total system height (from the floor the appliance is mounted on to the top of the chimney) should never be less then 15 ft. Most normal installations exceed this height, but installations in cottages with shallow-pitch roofs may not. If draft problems are experienced with short system consider adding to the chimney height. If draft problems are experienced with systems higher than the recommended minimum system height, adding to the chimney may have little or no effect. Most draft problems have to do with inadequate gas temperature in the chimney. The chimney flue should be the same size as the appliance flue collar. Chimneys that are over-sized for the appliance they serve are common, partly because people think the bigger is better. Now it is clear that bigger is not better when it comes to chilney sizing. A given volume of flue gas flows faster and has less time to lose heat in a small chimney flue than in a large one. In planning wood heating systems, experienced installers will sometimes choose a chimney that has a smaller inside diameter than the appliance flue collar. This is usually done when the chimney runs inside the house and is very tall. Chimneys that exceed 8 m (about 25 ft) in height sometimes produce more draft than the appliance needs, so a smaller chimney can be used whithout any reduction in performance. The decision as to whether the flue size may be reduced from that of the appliance flue collar must be left to an experienced thenician. Sizing is important because of the flue gas velocity. Since the temperature of the flue gas determines the strength of the draft produced by the chimney, the gases should stay hot until they leave the chimney. If thy move quickly, they have little time to cool by transferring the heat to the liner. In a liner is oversized, flue gases pass slowly through the chimney, and the heat to the liner. If a liner is oversized, flue gases pass slowly through the chimney, and the temperature can drop so low that little draft is produced. A properly-sized liner maintains gas velocity so it stays hot, producing stronger draft. Conductive heat losses are greater for liners with larger cross-sectional areas. An 8''diameter round liner can have up to 30% greater surface area of the larger liner and because lower gas velocity allows more time for heat transfer. This transfer can cause a significant reduction in flue temperature and draft, particularly for controlled combustion appliances. While flue oversizing causes serious performance and safety problems, undersizing also has drawbacks. In normal residential situations, the chimney flue area should match that of the create too much resistance to gas flow. This resistance is not usually a problem during normal operation, but can result in smoke spillage when the appliance door is opened for stoking. Flex liners offer considerably more resistance to flow and more surface area for heat transfer than rigid liners so be cautious about undersizing of flex liners. Flow resistance increases with length, so a tall chimney with an undersized liner may create problems. Elbows and offsets add flow resistance to the system and they are a particular problem. All flue pipe assemblies should be designed to be as straight and direct as possible between the appliance flue collar and the chimney base. Keep the number of elbows to a minimum because gas flow is restricted somewhat by every change in direction. 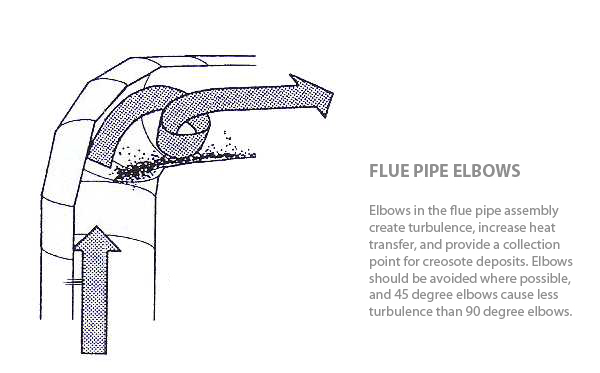 At elbows, the gas become more turbulent, slow down, and give up heat more quickly tot the flue pipe wall. Whenever possible, reduce obstacles to smooth gas flow by using 45) elbows instead of elbows. 1/Single wall stove pipe will a low more heat into the room, however, it lowers flue gas temperature. 2/Vented double wall pipe also reduces flue gas temperatures more than conventional double wall pipe. Up to half the weight of a freshly cut log is water. After proper seasoning the water is reduced to only about 20 percent. As the wood is heated in the firebox, this water boils off, consuming heat energy in the process. the wetter the wood, the more heat energy is consumed. That is why wet firewood sizzles and is hard to burn while properly seasoned wood ignites and burns easily. As the wood heats up above the boiling point of water, it starts to smoke. The smoke is the visible result of the decomposition of the solid wood as it vaporizes into a cloud of combustible gases and tar droplets. The smoke will burn if the temerature is high enough and oxygen is present. When the smoke burns, it produces the bright flames that are characteristic of wood combustion. If the smoke does not burn in the firebox, it will exit the appliance into the chimney where it will either condense forming creosote deposits or he expelled as air polution. Unburned smoke represents an efficiency loss because it contains a large part of the total energy in the wood. As the fire progresses and most of the gases and have vaporized out of the wood, charcoal remain. Charcoal is almost 100 percent carbon and burns with a red glow and very little flame or smoke. Charcoal is a good fuel that burns easily and cleanly when enough oxygenn is present. all three of wood combustion occur simultaneously. That is, the wood gases can be flaming and edges of the pieces can be glowing red as charcoal burns, while water in the core of the piece is still evaporating. The challenge is burning wood effectively is to boil off the water content quickly and make sure the smoke burns before it leaves the firebox. Sizing. The size of the firewood pieces affects the rate of combustion. Larger pieces ignite and release their energy more slowly than small pieces. Smaller pieces are better for short, hot fires and larger pieces are preferable for extended firing cycles. is brought in from outdoors in winter and loaded into the appliance immediatly will cool the fire too much and prevent proper combustion. Certain types of fuel wood release more heat than others. Hardwoods, such as oak, are denser than softwoods such as pine. Hardwoods will burn longer and give you more heat. Unseasoned "green wood," will burn with difficulty, and will also, because of its high water content, produce more creosote. 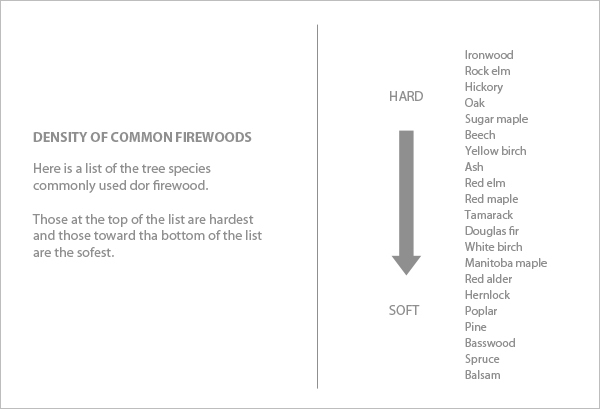 Although the energy content of dry wood per kilogram is almost the same regardless of species, softwoods and hardwoods burn differently because of differences in density. Softwoods, such as pine, spruce and cedar are less dense than hardwoods like oak, maple and beech. Although hardwood trees are plentiful in parts of North America, there are area particularly in the west where softwoods are the only fuel wood. Hardwood is usually considered the preferred firewood because it fends to produce a longer-lasting coal bed. 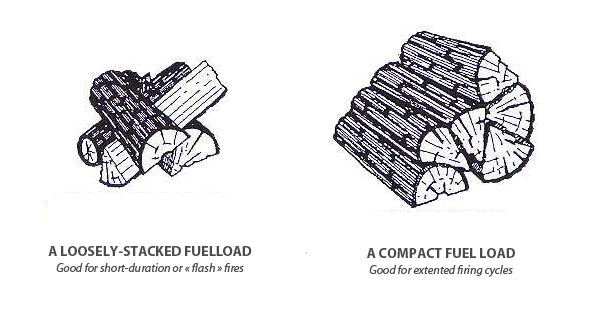 Fuel load geometry : Small pieces of firewood arranged loosely in a crisscross pattern burn quickly because the combustion air can reach all pieces at once. Larger pieces placed compactly burn more slowly because there are fewer spaces where the air can penetrate the load. Never add just one or two pieces of wood to a fire. 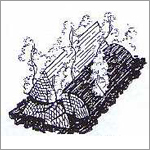 Three or more pieces are needed to form a sheltered pocket of glowing coals that reflect heat toward each other and sustain the fire. Fire in cycles : Don't expect perfectly steady heat output from the fire. Wood fires burn best in cycles. A cycle is the time between the ignition of a load from charcoal and the consumption of the load back to a coal bed. Each cycle should provide between four and eight hours of heating, depending on how much wood was used and how much heat is needed. Plan the firing cycles around your household routine. If someone is home to tend the fire, use a short firing cycle. If you much be away from the house during the day, use the extended firing cycle discussed below. The flash fire : A flash fire is a small amount of wood burned quickly. Use it in spring and fall when you just want tot take the chill off the house. The flash fire technique eliminates the smouldering fires that are common in spring and fall. To build a flash fire, rake the charcoal towards the air inlets and place several small pieces on and behind it. The pieces should be stacked loosely in a crisscross arrangement. 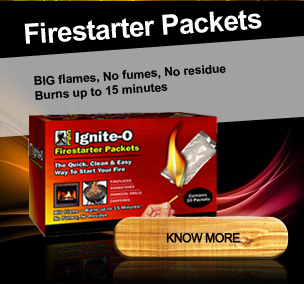 Open the air inlet to produce a hot, bright fire. The air supply can be reduced slightly as the fire progresses, but never enough to extinguish the flames. 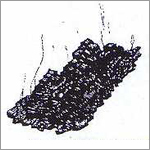 When only charcoal remains, the air supply can be reduced further to prevent cooling the coal bed. The extended fire : To achieve a longer-lasting fire, rake the coals towards the air inlets and use the larger pieces of wood placed compactly in the firebox. Placing the pieces close together prevents the heat of flame from penetrating the load and saves the buried pieces for later in the burn cycle. Open air inlets fully for between 15 to 30 minutes depending on load size and fuel moisture content. When the outer pieces have a thick layer of charcoal, and reduce the air control in stages to the desired level. The charcoal layer insulates the rest of the wood and slows down the release of combustible gases. This allows you to turn down the air control and still maintain a clean-burning fire. Use the extended fire technique to achieve an overnight burn or a fire to last the day while you are at work. Do not let the fire smolder. Removing ashes: When you follow the suggestions for raking or the coal bed, you will find that ashes accumulate at the front of the firebox. These ashes can be removed easily before coal bed raking in preparation for loading. Most modern wood-burning appliances work best when a small amount of ashes is removed each morning before the first fire of the day is built. A sweep will clean the system top of bottom and report any problems to you. The sweep might suggest that it is time to replace the flue pipes, catalytic combustor, or door gaskets and will probably be able to do the work for you when the time comes. Your wood heating retailer may also offer sweeping and maintenance services. The chimney and flue pipes must be checked regularly until rate of creosote build-up is determined. Chimney fires usually occurs because the user was surprised at how fast the deposits developed. Check them and clean when the deposits have build up to more than 4mm (1/8''). Older systems, or ones that are smouldered too much can need cleaning as often as every three weeks. Most modern systems operate so efficiently that cleaning is needed only once a year. Never assume the chimney is clean ; check it often to be sure. During maintenance it is a good idea to check for condition of the chimney and flue pipes to determine if there has been any deterioration. Check the flue pipes for corrosion that can weaken the joints. Look for corrosion or rust stains on the outer shell of a metal chimney, and check for bulges or corrosion in its liner. When inspecting a masonry chimney, look for black or white stains on the outer bricks, and cracks or missing pieces of chimney liner. Always check the condition of the chimney in hidden spaces including the attic, wall and chimney chase areas where corrosion and other deterioration can occur. The most thorough cleaning and inspection of the system should be done in the spring just after the heating season is over. If you leave deposits in the system the warm humid summer air will cause corrosion of steel parts. Cleaning and inspection in spring will also give you plenty of time to order replacement parts and do any repairs that are necessary before the fall heating season begins. If you see any problems during your cleaning and inspection, have the system thoroughly inspected by a qualified chimney sweep and repaired before continuing to use it. These gaskets and seals are used by the appliance designer to control the location and flow rates of air into the appliance. Leaky seals will reduce the efficiency of the unit. Some gaskets may need replacement as often as once per year, and others may be fine for several years of use. All gaskets and seals should be checked at least once per year during a through maintenance check and perhaps once during the heating season. When wood is burned slowly to make a smoky fire, the smoke can be condensing on the cool inner surface of the chimney producing creosote deposits. Creosote is a highly-flammable material. If it ignites at the base of the chimney, it can produce a raging fire that travels up can the chimney causing extremely high temperatures as it spreads. The high temperature can damage the clay liners in a masonry chimney or the metal liner in a factory-built chimney. Although 650° C chimneys can withstand chimney fire temperatures, the heat still causes extreme stress in the chimney. Chimney fires are the result of poor appliance firing-techniques combined with a lack of proper chimney maintenance. 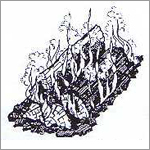 When wood-burning appliances are operated properly using the techniques outlined later, some creosote may still be deposited, but it will be of less combustible type. Instead of the black, tarry type of creosote that results from smoldering fires, the creosote that results from proper firing is soft, flaky and dark brown in colour. Chimney fires can be prevented. Chimneys should be checked for creosote deposits regularly until you know how quickly it builds up in your chimney. Conventional wood stove can produce creosote quickly because they are unable to burn the wood as completely as advanced designs. In severe cases, enough creosote to sustain a damaging chimney fire can be deposited in only a few days. The newer, low-emission wood stoves burn the wood so completely that, when they are operated properly, their chimneys normally need cleaning only once each year. The combustion process when wood is burned is never complete. The smoke from a wood fire usually contains a dark brown or black substance which has an unpleasant odor. This tar like substance is called creosote, and is found almost anywhere in a wood heating system. At temperatures below 250° F creosote will condense on the stove pipes or chimney flues. This substance is very flammable. 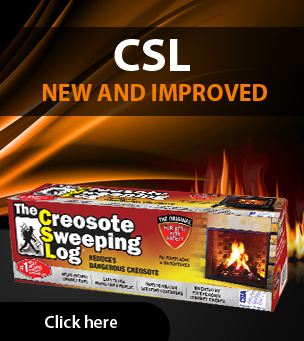 Creosote is more of a problem with wood stoves than fireplaces. Since the exhaust gases from stoves are cooler than those from the fireplaces the amount of creosote varies according to the density of the smoke ( less smoke means less creosote) and also the type and dryness of wood being burned. From 5 to 30% of the energy contained in every log escapes up the chimney when wood is burned. The catalytic combustor is designed to make use of the energy by converting it into useful heat, as it lessens chimney creosote build up, and, air pollution. The catalytic combustor (converter) consists of a durable temperature resistant ceramic composition which is extruded into a honeycomb configuration. After extrusion this ceramic is fired and covered with a “noble metal catalyst”. When wood smoke contacts this catalyst, chemical changes occur that causes the smoke to ignite at temperature around 500°F. Normally smoke will ignite and burn only at temperature around 1000°F. The combustor should be inspected on a regular basis, especially, after having used a CSL. Flakes of treated creosote may dry and fall onto it. A soft brush, low pressured air, or plain water with a little bit of vinegar in it should be used to clean the combustor. The ceramic unit is fragile, so handle it with care. Chances are your chimney is equipped with a smoke shelf. There is a cavity that is behind the damper known as the “smoke shelf”. Much of the fallen debris, produced by repeated fires, ends up staying on that smoke shelf. Depending on how often the smoke shelf is cleaned there can be a considerable amount of buildup. Try to clean it periodically either with a curved brush, or a wet-vac type vacuum cleaner, but not your standard household vacuum. It might get damaged by the soot particles. If you are unsure about the location or condition of the smoke shelf, you should consult a professional.